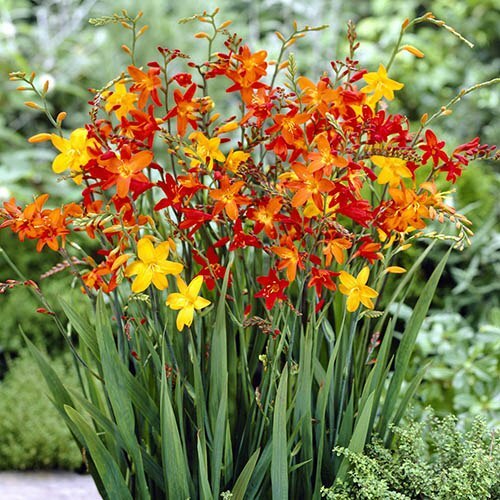 Create a fiery feature with these beautiful perennial flowers. These fantastic Montbretia will add colour and height to your beds and borders this year. They will come alive in mid-summer with an explosion of yellow, orange and red blooms. Growing to around 60-90cm (2-3ft) tall, they are perfect for the back of borders. They are very hardy perennials (to at least -20C! ), and some of the very easiest plants to grow. Supplied as a pack of 25 mixed bulbs, ready to plant. Height/spread: 60-90cm (2-3ft). These fantastic Montbretia will add colour and height to your beds and borders this year, coming alive in mid-summer with an explosion of yellow, orange and red blooms. Growing to around 60-90cm (2-3ft) tall, they are perfect for the back of borders. They are very hardy perennials (to at least -20C! ), and some of the very easiest plants to grow. They will thrive in any conditions moist or dry soil, full sun or shade, shelter or exposed spots requiring almost no maintenance. Ideal for novices or busy gardeners who cannot afford to spend lots of time making their gardens look great! Plant them in clumps - groups of 5 are ideal 10cm (4) apart.